Hello! 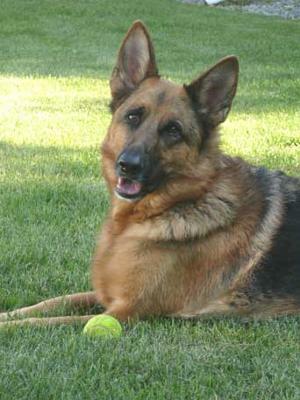 I just found your fabulous website and I have been sharing it with all my German Shepherd friends. I am attaching a photo of one of my dogs. Her name is Heidi and she is 6 years old. We got Heidi when she was a puppy. She has such a wonderful temperament that we used her as a therapy dog in a local nursing home for almost 3 years. Heidi's most favorite thing however is chasing her ball! She could run forever! She also loves hiking with our family and romping with her older GSD brother, Mick. He is 9 yrs old. Heidi keeps him on his toes and hates when Mick wants to rest. She constantly is in his face and telling him "let's go out and play!" I am happy to share our wonderful Heidi picture with you and hope you enjoy seeing it as well. Thanks so much and I look forward to reading your newsletters!